Today we are going to share more details about what is new and what is changing with our 2014 fatbike tire collection. There will be a total of five different fatbike tire options in two different tread patterns: Hüsker Dü and Dillinger. The Escalator has been discontinued and will be replaced with a 120tpi folding Dillinger stud-less, which is also known as “custom-studdable.” We felt it was best to keep all versions of the same tread pattern under the same model name, which is the primary reason for the change. It will also be much easier to identify 120tpi and 27tpi tires with our updated hotpatches that communicate the basic tire specs. The Dillinger 120tpi folding tire will be coming with carbide-aluminum studs again in 2014. 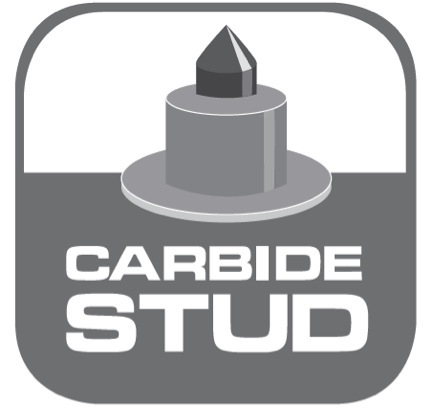 Our carbide-aluminum studs are assembed from two components: an aluminum base with a pan-head shape, and a pointed carbide tip. Being the next densest material to diamonds, carbide resists wear from regular contact with other abrasive surfaces like asphalt. The aluminum bases that hold the carbide tip are half the weight of stainless steel, which adds up to a lot less rolling resistance when multiplied times 240 (Dillinger stud count). The combination of super durable carbide and super lightweight aluminum provides the optimum balance of durability and performance. The Dillinger 27tpi wire bead model will be coming with steel-carbide studs for 2014. Using the same two-piece construction method as the standard carbide-aluminum product, the steel-carbide stud features a dome-shaped carbide tip with a steel base, making it a more economical stud for 45North’s 27tpi tire collection. The Hüsker Dü will be available once again in 120tpi folding and 27tpi wire bead options, with updated hotpatches that communicate the casing and bead types. Small changes have been made to our rubber compounds to provide more durability without compromising the supple feel that is so important on fatbike tires. 27tpi versions will be shipping to dealers in early September.